in the line of Shree Caitanya Mahaprabhu and Shree Rupa Gosvami..
Nitya-Lila-Pravishta Om Vishnupad Shrila Bhaktivedanta Narayan Gosvami Maharaj. You may also want visit the links on the top right of the website menu. 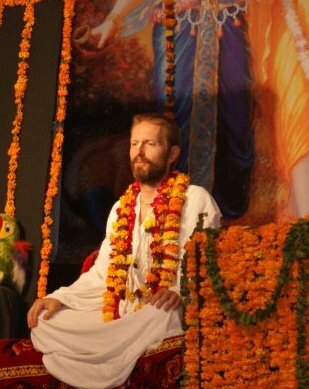 Shree Prem Prayojan Prabhu is one of the prominent diksha disciples of nitya-lila pravishta Om Vishnupad B.V. Narayan Gosvami Maharaj. He is travelling the world, freely distributing the nectar of transcendental love and service for Radha-Krishna.